'And the soul of the rose went into my blood' (from Tennyson's Maud). 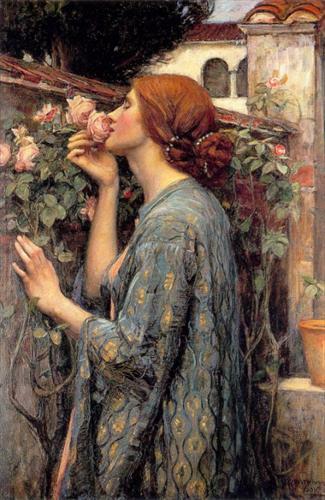 The Soul of My Rose by John William Waterman, 1908. What is it, that has been done? That must have life for a blow. Ever and ever afresh they seem’d to grow. Was it he lay there with a fading eye? It will ring in my heart and my ears, till I die, till I die. What was it? a lying trick of the brain? High over the shadowy land. We are not worthy to live. Why should it look like Maud? Is a juggle born of the brain? But that of Lamech is mine. Not to be trampled out. Which else would have been past by! It is his mother’s hair. Who knows if he be dead? Whether I need have fled? Am I guilty of blood? While I am over the sea! And comfort her tho’ I die. Courage, poor heart of stone! When thou shalt more than die. My own dove with the tender eye? Pass and cease to move about! To the regions of thy rest’? As the churches have kill’d their Christ. The case of his patient–all for what? For it is but a world of the dead. But babble, merely for babble. Everything came to be known. Who told him we were there? Crack them now for yourself, and howl, and die. Except that now we poison our babes, poor souls! It is all used up for that. But is ever the one thing silent here. Stiller, not fairer than mine. Would he have that hole in his side? But what will the old man say? When he comes to the second corpse in the pit? O me, why have they not buried me deep enough? Me, that was never a quiet sleeper? Deeper, ever so little deeper.